Last month the supporting cast of Alexandra Aja's adaptation of Horns, the novel from writer Joe Hill (son of Stephen King), added Kelli Garner ("Pan Am"), Juno Temple (The Dark Knight Rises), Max Minghella (The Social Network) and Joe Anderson (The Crazies). But the real draw for audiences will be Daniel Radcliffe in this story of a guy who wakes up to find that his girlfriend has been raped and killed. He's the lead suspect, and he has sprouted horns that grant him the power to make people confess their sins, which is handy as he searches for his girlfriend's killer. Now we have a first look at Radcliffe in the film! Alexandre Aja (Piranha 3D) directs Horns with a script from Keith Bunin ("In Treatment") based on Joe Hill's novel of the same name. The story follows a 26-year-old man (Daniel Radcliffe) who wakes up after a nasty hangover to find that his girlfriend (Juno Temple) has been raped and murdered. Worse news: he's the lead suspect Then he discovers horns growing out of his head that grant him the power to make people confess their sins, which comes in handy as he searches for his girlfriend's killer and prepares for revenge. Kelli Garner, Max Minghella and Joe Anderson also star in the film arriving in theaters sometime in 2013. I loved the book and the movie looks really good. 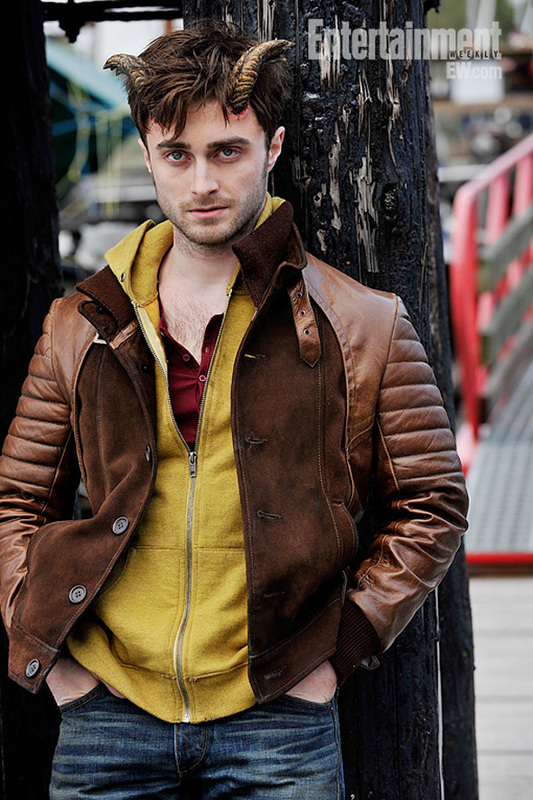 I like daniel radcliffe. I loved the book, as well. Looks like some changes have already been made, as the horns appear in the book a year after the murder . . . still looking forward to it! Daniel has become a good actor, it good to see him in different roles. So apparently Daniel Radcliffe is a horror fan. How cool is that? First Woman in Black. Now Horns. And if he has his way, he'll be in the new Frankenstein too. agree - i'm not sure about this adaptation.